I’m looking at how to do a USRP clone. After evaluating a little bit the Altera Cyclone FPGA development/starter kits I realized that I would need an extra USB controller like the original USRP has. Right now, I’m trying to figure out how to use the Cypress FX2 CY7C68013, together with the FPGA. The USRP FAQ on FX2 CY7C68013 has proven quite helpful, also the Design of a hardware platform for narrow-band Software Defined Radio applications” by Kalen Watermeyer . 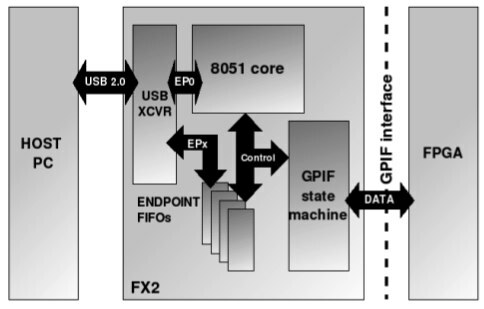 So now I think I’m going to order a Cypress FX2 CY7C68013 breakout card and read a little bit more about the FX2 - FPGA interface using the GPIF on Kalen’s thesis and reading gnu radio source code (there are some clues on the FAQ about which source files to look first).